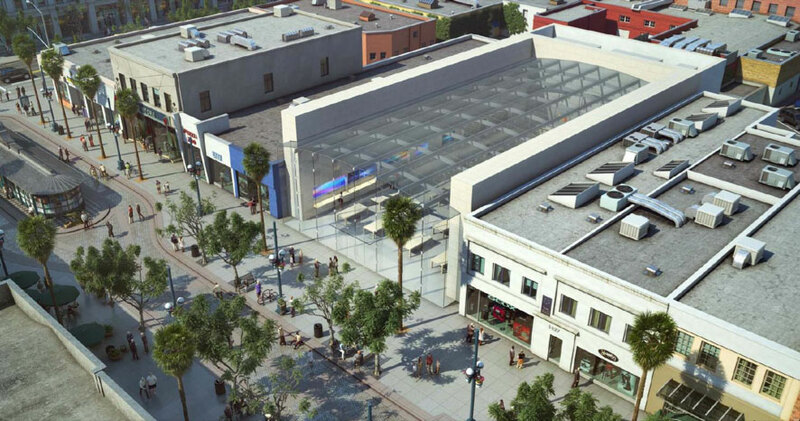 At the Santa Monica Planning Commission tonight, Apple is believed to be proposing a dramatic new Apple Retail Store on the Third Street Promenade in Santa Monica, California. As first noted by Curbed, the proposal is from an unnamed retailer who is seeking to construct a new 8,084 square foot commercial building in the place of an existing three story Borders Bookstore. The applicant is listed as "Howard Robinson" and the property owner as ASB/Blatteis Promenade Holdings, LLC, but one look at the renderings (above and below), and it's clear that this is an Apple Retail store project. The proposal (PDF) is for a one-story, 34-foot high commercial building with an "expansive floor-to-ceiling height accentuated by a transparent glass ceiling." The front will be entirely glass that will project from stone paneled side walls. A 5,210 sq foot basement will also be included. The applicant also intends to implement a transportation program for employees to travel to and from the store using alternative modes of transportation. Full-time employees will be offered $100 monthly transit subsidy and a $20/month bicycle reimbursement subsidy as well as bicycle parking in the basement level. Apple has been making some major upgrades to their retail stores in the recent months. Their 5th Avenue Store in New York is undergoing a $6.6 million upgrade while a new Grand Central project has also been making headlines. Apple, of course, already has an Apple Retail store on Santa Monica's Third Street Promenade, but it has been said to get very crowded on weekends, so this may represent an upgrade and replacement to the existing store. Glass is always a good idea in an earthquake zone. Wouldn't all that light shining down make it a little difficult to see what's being displayed on the LCD panels of the various products? If the ceiling glass is auto-dimming, color me impressed. Besides, I think it's a Microsoft store. That looks fantastic. Although I guess it will take a lot of cooling on sunny days! Its good to see the latest generation of stores being braver architecturally. If they are allowed to construct such a building then it's madness and puts everyone inside at risk. Modern buildings built in earthquake zones are built to very strict standards and are very safe. Take the huge earthquake in Japan this year - it was one of the 5 largest earthquakes ever recorded since 1900, but virtually all the deaths were from the resultant Tsunami, not the earthquake. Countless glass towers hundreds of meters high in Tokyo survived with little or no damage. In addition, modern safety glass of the type used in commercial buildings is very strong. In fact, concrete is often reinforced with glass fibers to make it stronger. Even in the unlikely event that something did cause it to fail, it breaks into small harmless pellets - NOT razor sharp shards. Do you really think that Apple's architects don't know what they're doing and/or aren't familiar with California building codes? You all are ridiculous! Apple isn't stupid! Apple didn't have MacRumors post this to get our feedback and bring out pros and cons...They obviously know about earthquakes, heat, sunlight. (I hope they planned for Tsunamis and forest fires! )-[*sarcasm] I mean seriously, they hire the best architects out there I am sure. They are sitting on $76 Billion in cash and securities what is to stop them from making this possible? So Apple rightfully doesn't install Flash because it is a energy hog but they have a building designed which doesn't function without a tremendous cooling system which is a much bigger energy hog. Stupid this design. You do know that several types of glass coatings have the ability to reflect a large amount of the infrared spectrum of light which would reduce the heat load caused by such a ceiling. Additionally polarization and other coating can reduce the total amount of light making it into the building. It will be interesting to see how Apple goes with this. I wouldn't want to be under any building during an earthquake. If it is severe enough to shatter that roof, then I doubt that falling floors, roofs, bricks and concrete are any more human friendly.